And here is my result – pretty yum, but not like the photos, oh well. What went well? Well, the site was right, you do need to purge the blood and veins out – oh GOSH it was DISGUSTING!!!! The water was pink and then I had to get scissors and cut off the yuck blood clots too eww eww eww. So anyway, then you get a new pot of water and then boil the bones. Boil them into absolute smitherines! Like this is what I ended up with after 4 hours (sorry I wasn’t committed enough for the full 15 hours specified on the site hahaha). 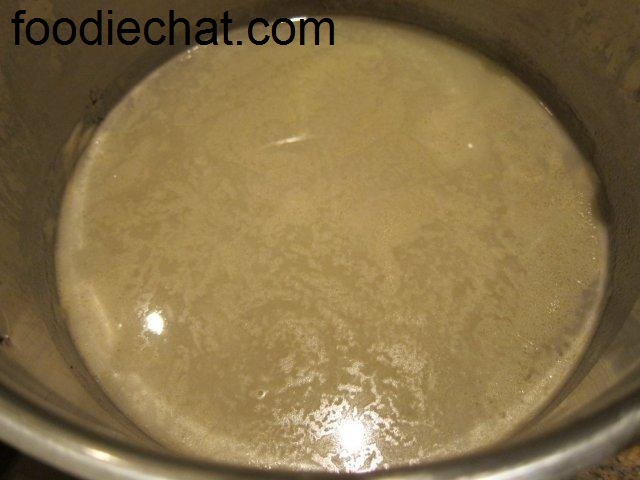 And the strained soup. Amazing, it did turn whiteish!! All this just from bones and water! 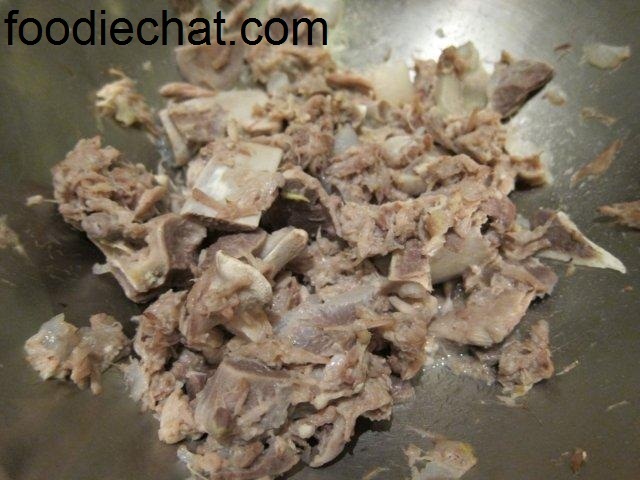 To come up with the final dish, I added miso paste to flavour, soy, white pepper, sesame oil and salt to taste. 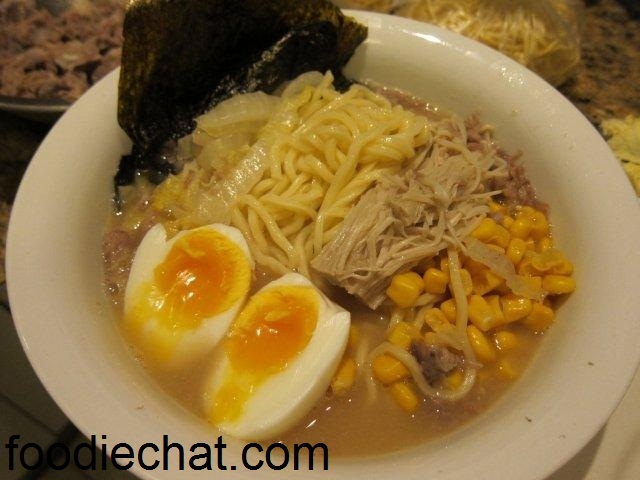 I served the soup with some blanched fresh ramen noodles, and topped with a soft boiled egg, seaweed and corn. I guarantee a warm and snuggly feeling after having a huge bowl of this… although I must also say… a bit of a belly from all that delicious soup! Immerse Yourself in Manly – deals and events! 4 Pines Brewing – take a complimentary trip out of this world with 4 Pines. Simply purchase a main meal between 11am-5pm, and receive a free handcrafted, naturally brewed, multiple award-winning beer. Once you’ve come back down to earth, Manly is the place to see and be seen. Hang with the hip at Hugos, flirt amongst the flamingos at Manly Wine, and chill out at China Beach. Maybe you’ll even spot a few famous faces. Hugos Manly – Enjoy a complimentary, and now famous, chocolate dessert pizza with any main course purchased. Ever since appearing on Italian Food Safari and seeing the real way to make amazing Spaghetti Vongole I have been dying to try this place. I knew it was a cosy little restaurant centred around a communal table, and I also knew that it is seriously popular. Both I found to be true when I visited! The large marble communal table is in fact the very bench where the chef makes handmade pasta daily as we are told by the waiter. In fact, it is so produce driven that there are only a few permanent menu items, printed on a piece of paper and tucked neatly into your napkin. The rest – actually, most of the menu, is repeated and described individually to everyone by the poor waiter. It was strange actually, bcos the specials menu was actually quite a bit more expensive than the regular menu, strange given that I would have thought that in season food would be cheaper to source. The regular menu is more Italian cucina pricing whilst the specials is more your fine dining ($35+ for mains). So we hedged our bets, obviously! 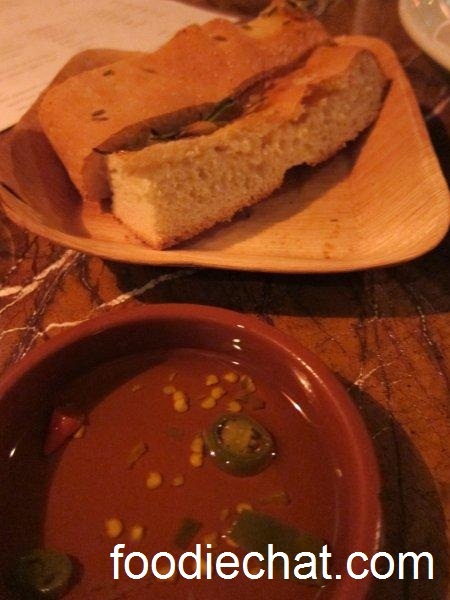 When you are seated, you are presented with some fresh made foccacia and chilli oil for dipping. Nice. The bread is so soft and fluffy with a just lightly crispy crust with a slight oily texture to the touch. The chilli oil could have done with a bit more of a kick for my liking, but that’s just me, and would most probably have masked the bread! So for entrees, I had the salami entree. It was $14, and I was a bit disappointed with its simplicity. 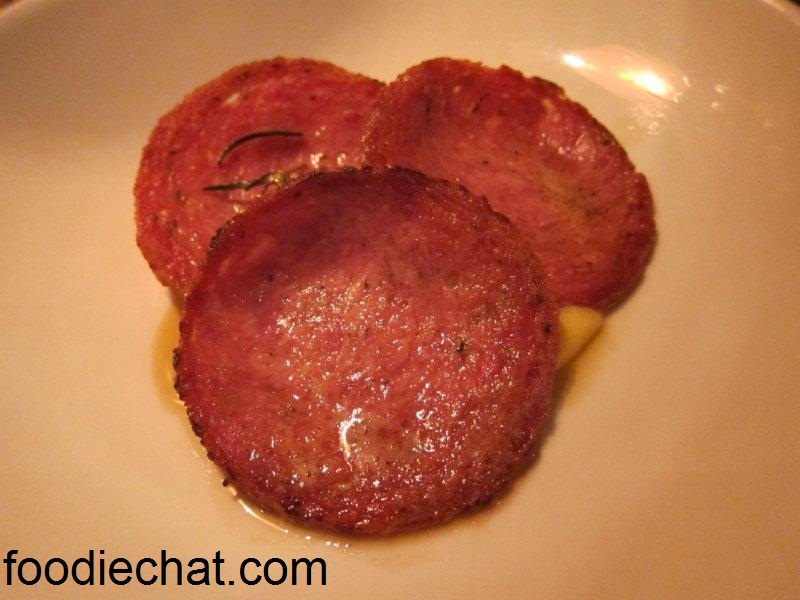 Three slices of salami lightly fried served on a bed of polenta. A bit more polenta would have been great – or at least another carb provided or even a veg, as the salami is very full bodied and salty to have on its own. What I should have gotten was the scallops from the specials menu, served with roasted baby beets including my new favourite thing – heirloom varieties, so pretty! The dish was scattered with pomegranite seeds and served with rocket. Good to have the balance of veges, and you have to agree – such a pretty plating up, which contrasts to the rustic simplicity of the normal menu. Are you getting the contrast? The scallops would not look out of place at a three hat restaurant! 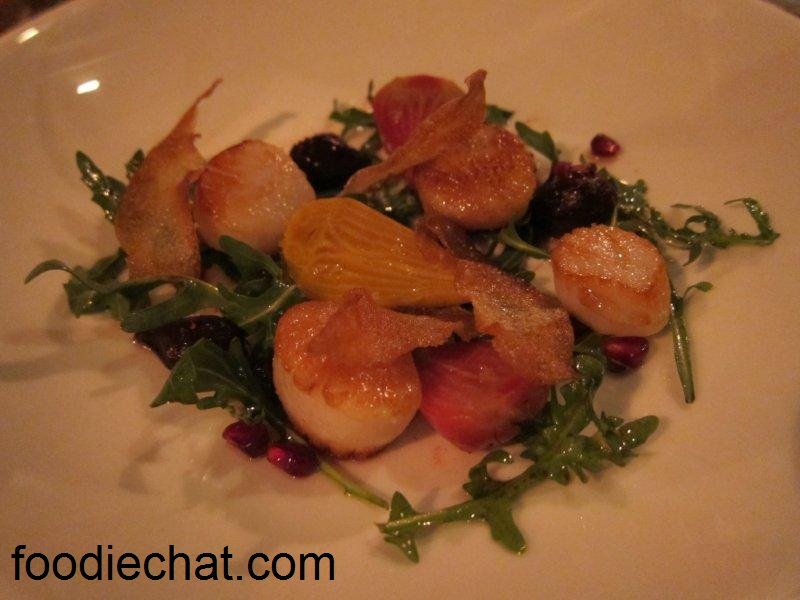 You are currently browsing the FoodieChat weblog archives for July, 2011.